Recently we received funding to conduct targeted surveys for reptiles, including the threatened Pink-tailed Worm-lizard Aprasia parapulchella, in the NSW Central Tablelands (Cowra, Canowindra, Woodstock and Darby’s Falls areas). Pink-tailed Worm-lizards are listed as vulnerable in Australia and are found in grasslands and woodlands of SE Australia. This legless lizard can grow to approximately 14cm in length and is often found living in ant or termite nests where it feeds on their larvae and eggs. Pink-tailed Worm-lizards are generally found in rocky outcrops or areas with scattered surface rocks and can be very difficult to detect. Even in areas of suitable habitat, there are only a few known records for this poorly understood species; with many records coming from our group’s own research on privately owned farmland. The same is true for many species of reptile found in the woodlands. The project is funded by Central Tablelands Local Land Services NSW. 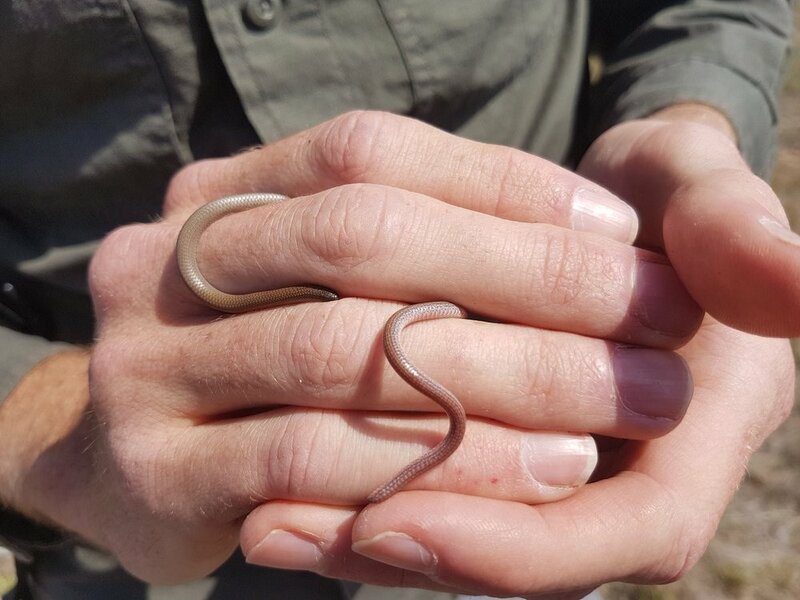 The primary aim is to obtain new location records for some of the reptile species in the study area, including Pink-tailed Worm-lizard, and gain a better understanding of their habitat requirements and local distribution. Due to a hot, dry spring, which seemed to be affecting survey success, we’ve now completed these surveys for 2017 and are pleased to report that they were a great success. Over the course of 5 weeks in spring, we intensively surveyed around 40 sites, mostly on private farmland, finding over 350 individual reptiles and many frogs as well. In all we found 22 species of herpetofauna (reptiles and frogs) including our species of special interest—the Pink-tailed Worm-lizard. We found 33 Pink-tailed Worm-lizards during our surveys and uncovered three previously unknown populations. Of particular interest are sites where we detected Pink-tailed Worm-lizards on a hill range where they have not previously been recorded. Other interesting species that we found in good numbers were the Thick-tailed Gecko Underwoodisaurus milii and Dwyer’s Snake Parasuta dwyeri. Little is known about reptile distribution patterns and habitat use on private farmland in the region and the data we have collected will be important in filling in some of the gaps in that knowledge. Looking forward, we plan to install stock exclusion fencing in areas with key populations to assess the reptiles’ sensitivity to grazing. If we can secure more funding we aim to continue the surveys and visit more of the many keen landholders who expressed an interest in these reptile surveys. We also plan to expand these surveys beyond the Cowra region in the coming years and experiment with the use of artificial substrates as a habitat restoration technique. Our hope is that this project will complement our existing work and allow us to further inform management strategies for the conservation of reptiles in agricultural landscapes. Many thanks to all the interested and engaged landholders who are involved in this study.